Options Spray - 32 oz. You trust the Advantage name for your pet's pest control. Now get 360 degree protection from fleas, ticks and other pests with Advantage Yard & Premise Spray. For use around the perimeter of your home and on your deck & patio, Advantage Yard & Premise Spray kills fleas and ticks through contact, and can be used in conjunction with any flea and tick spot on or oral preventative or medication. Advantage Yard & Premise Spray kills fleas and ticks that may carry Lyme Disease. 32 oz treats up to 16,000 square feet. 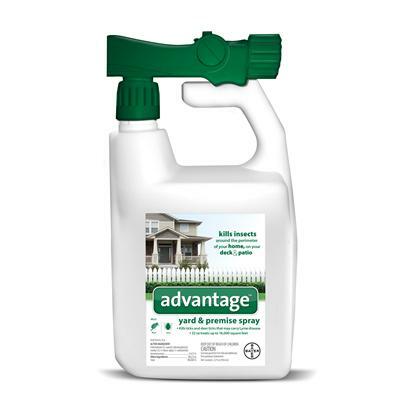 Add the next level of pest prevention with the NEW Advantage Yard 7 Premise Spray, from Bayer. Harmful if swallowed or absorbed through skin. Causes moderate eye irritation. Avoid contact with skin, eyes, or clothing. Prolonged or frequently repeated skin contact may cause allergic reactions in some individuals. Wash thoroughly with soap and water after handling. Read full directions before using. To kill fleas and ticks harboring in lawns and backyards. For best results, lawn should be mowed a day or two before spraying. Spray using a slow, even sweeping motion, being sure to cover the entire lawn surface where the pets will normally frequent. Spray under ornamentals and trees, but avoid soaking young or flowering plants. Kills on contact the lxodes scapularis tick (deer tick), which may carry Lyme disease. Keep pets and children out of treated areas until after the spray has dried. Do not spray animals. Dogs, cats, their kennel or bedding area should also be treated with a registered flea and tick control product in conjunction with this application. 1. Connect sprayer to hose and turn on water. 2. Point in the direction you want to spray, turn the sprayer control knob to the ON position, and spray. 3. To stop, turn the sprayer control knob to the OFF position and turn off the water. 4. When finished, relieve water pressure by turning the control knob back to ON until the line is depressurized, then turn back to OFF. 5. Disconnect the sprayer from the hose.